Released in Hong Kong today is the Cars Workshop 1/24 scale KMB DMS. It is limited to 500 pieces. Further details will appear shortly. Creative Master Northcord Limited is proud to release the Green Bus livery on its well-known 11-metre, tri-axle Leyland Olympian / Alexander R-type coach model. 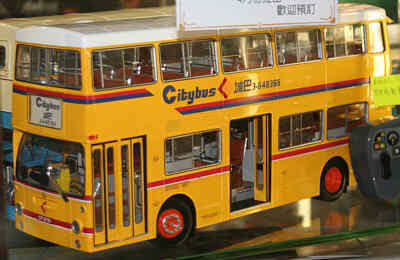 The model represents Stagecoach in Warwickshire 13650 (H627 LNA) in the Green Bus livery that formerly operated with Citybus in Hong Kong as its 160 (ET 1190). Although most of the former Citybus 11m coaches have served on the Megabus network, the arrival of new Neoplan coaches rendered some Olympians surplus to the requirements of the Megabus fleet, and toilets were not needed on these. 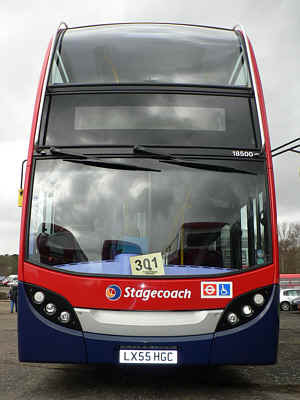 13650 initially served in Manchester on MagicBus routes before being transferred to Stagecoach in Warwickshire. 13650 is one of four that entered service on the Green Bus routes. The Green Transport Company runs bus services to schools in the UK using its Dutch-designed “The Green Bus” brand. Four ex-Hong Kong megadeckers are operated by Stagecoach in Warwickshire on behalf of The Green Transport Company, and are based at Leamington depot. Each carrying 94 passengers, the coach-seated, air-conditioned megadeckers have become popular with pupils. They operate throughout Birmingham and the West Midlands on services to and from King Edward VI Five Ways School, and are available for private hire. As on the previous successful hkbus 2000 series models produced by CMNL, hkbus 2007 has many innovative designs on the tooling, some of which were seen for the first time on a CMNL double-deck model. The replica features excellent detailing, inside and out, including all handrails on board and detailed, individual air-vents above the seats. Of note is the improved upper-deck ceiling detail that features the correct colours of the prototype coach. The most remarkable accuracy is seen on the front dome that represents this feature of the Alexander R type bodywork. Once again, this is a one-piece casting whose clean lines accentuate the windows and livery application. The model has no ugly metal poles to hold it together. 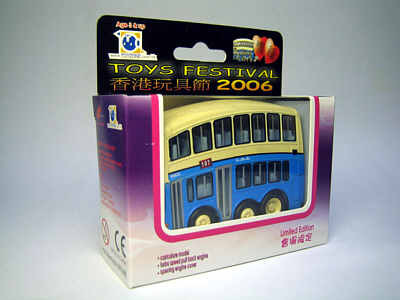 The hkbus 2007 model is limited to 1,800 pieces worldwide. They will be distributed by John Ayrey Die-Casts Limited (UK), Concorde Hobby Shop (HK) and Porte Publishing Company (Japan). 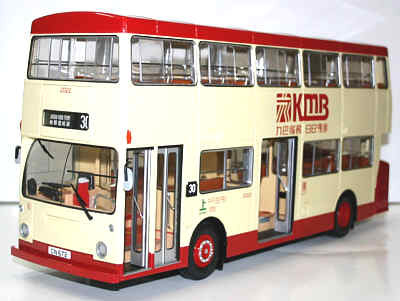 The 80M Bus Model Shop website is now showing photographs of the 1/24 scale KMB DMS from Cars Workshop. I am unable to confirm the fleet number for this model, but hope to receive photographs shortly. 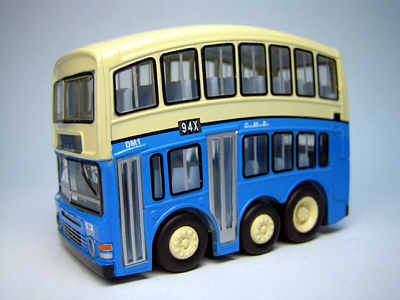 It is also confirmed that the P & T resin Dennis Pax (B0016) has been released. This features HK4092 on route no 18 between Un Long and Sheung Shui. It is limited to 400 pieces and reatils for HK$308. New pages have been added for the three qb models featured in yesterdays News. Links to these pages have been added to each of the photographs. A further Checkmate model has been added to the Checkmate pages of the site, this being a Jinling double-decker in plain white livery with blue front and rear bumpers (90121). A further details on this model would be welcome. 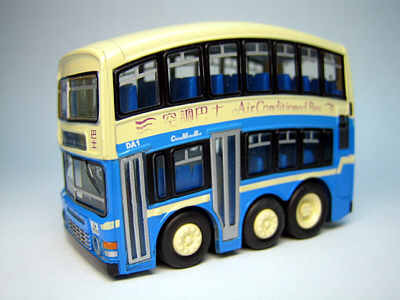 Following yesterday's news, I can indeed confirm that Cars Workshop are to release a 1/24 scale Kowloon Motor Bus DMS. The news is featured in the KMB 'KMB Today' magazine, and the model will retail for HK$1,498. No release date is yet known, but if anyone can provide any further information, please e-mail me. In preparation for the new page for this model, can anyone supply me with a photograph of a real KMB DMS in it's non 'air-con' livery? Following the recent addition to the site of models that never made it into final production, I have now received photographs of the pre-production Corgi model 43213, one of which is pictured above, and these have been added to the appropriate page. The above two QB models were released in Hong Kong today. Commissioned by the Hong Kong Transport Society, the first represents China Motor Bus Dennis Condor DA1 in original 'air-con' livery. The second features non 'air-con' CMB Dennis Condor DM1. Both are limited to 2,000 pieces each. Further details and photographs will be added over the weekend. A third QB CMB Dennis Condor has been commissioned by Toyzone, a Hong Kong toyshop, and was available at the Toys Festival 2006 held in Kowloon Bay on 16th April. This features DM23 and is limited to 1,000 pieces. Again, further photos will be added over the weekend. 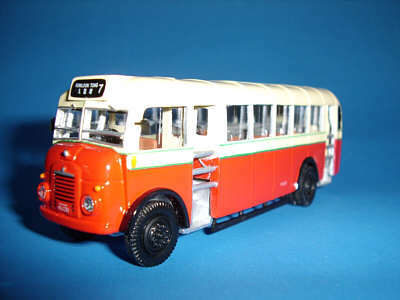 A 1/24 scale Kowloon Motor Bus DMS is currently up for auction on one of the most popular on-line auction sites. The picture shows what appears to be an extract of KMB Today, although I cannot confirm this, and no photograph of the actual model appears. It states that it is one of 500 and has Route Nos. of 2C, 7, 11B, 30 and 101. Presumably news of it's release will be announced shortly. My thanks to Andrew Shirley for tipping me off about a new resin model that appears on the Hong Kong Model Co. website. This is a Kowloon Motor Bus Bedford SBO, registration number HK4289 on route no. 7 to Kowloon Tong (8143A). It is described as 'Coming Soon' and will retail for HK$288. I have just added a new section to the site which features models that never made it into final production. Just follow this link or access the pages by choosing 'models' in the top or bottom menu bar, and then selecting 'Special Models' at the foot of the 'Model Index' page. 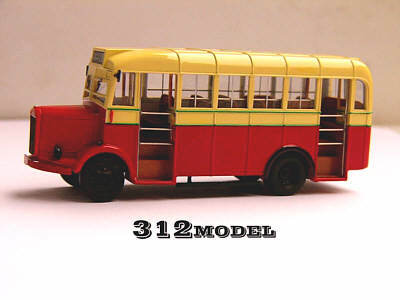 After careful consideration, I have decided not to include the various larger scale Chinese coaches that are currently available, concentrating instead, as the name of the site suggests, on 'Oriental Model Buses', but will include those at modelled at 1/76th scale. It has been confirmed that the Cosmopolis Bus Fan Club website is now back on-line. 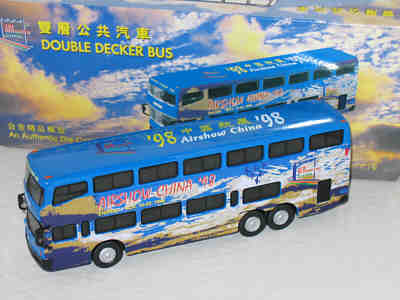 Photographs of another Checkmate model have been added to the site tonight, this being the Jinling double-deck bus with all over decals for Airshow China '98 (90090). I have received an unconfirmed report that KMB are to issue a model of a Volgren bodied Volvo Super Olympian - watch this space! 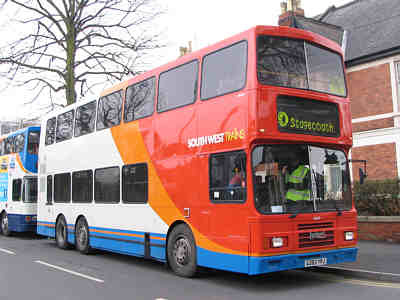 My thanks to 'megabus13601' for sending me a couple of photographs of the recently announced South West Trains liveried former Citybus Olympian (hkbus2008), which have just been added to the appropriate page. In addition, I suggest you take a look at the 'megabus13601' Fotopic site, which is totally dedicated to tri-axle Leyland Olympian buses. 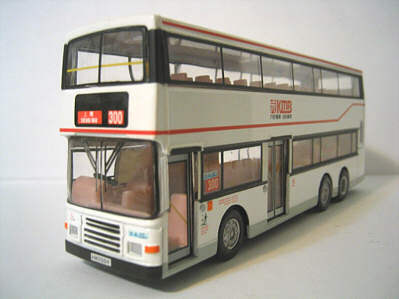 Whilst checking the page detailing the recently issued Bus Fan World Britbus Olympian (R900BFW), I am unable to confirm the total number of models released. I shall therefore be grateful if anyone can provide me with the figure quoted on the limited edition certificate - thank you. Update...... My thanks to Norris Law who has confirmed that the limited edition certificate states a total of 360. 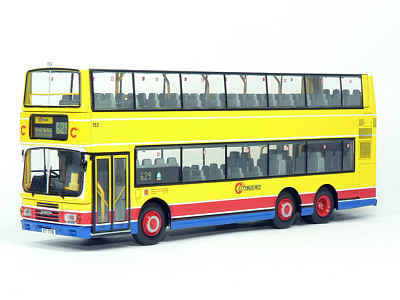 Due for release on Friday 14th April, is the Citybus 1/24 scale DMS, this being issued by 80M Bus Model Shop and carries a product code of 12401. Further details and photographs can be found at this new page. It is limited to 338 pieces and retails for HK$1,498. "Having had many enquiries from collectors in Hong Kong, I have made a limited quantity available at Concorde Hobby Shop. Please contact them for details - be quick, there are less than 100 available!." ( NB. The Concorde Hobby Shop website appears to be down at present). A previously unannounced model, due for release in July, is Hampshire Bus No 13640, formerly Citybus No 113, in South West Trains livery (hkbus2008). A photograph of sister vehicle 13634, in the same livery, is featured in the News item for 4th January 2006. The full Press Release can be viewed on the Creative Master Northcord website. Following yesterday's news, I can confirm that the above example was on show at one of 80M Bus Model Shops. It is expected to be released later this month. The price is HK$1,388 for orders in advance or HK$1,498 if purchased after it's release. It is believed to be limited to 338 pieces (maybe 388?). Further details will be published, once received. 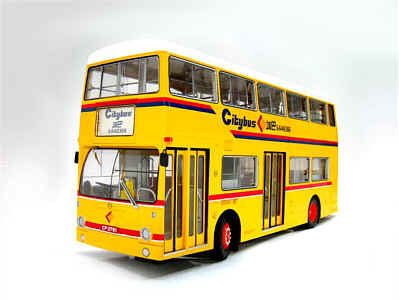 On sale today at Cobham was the specially commissioned Creative Master Northcord Ltd. Citybus Leyland Olympian No. 152 (hkbus0001). New photographs have tonight been added to that page. This model is available only from Dave Roger's and further details can be found at his website. Totally unrelated to this site, a new Enviro 400 pictured at Cobham today, but I just couldn't resist!